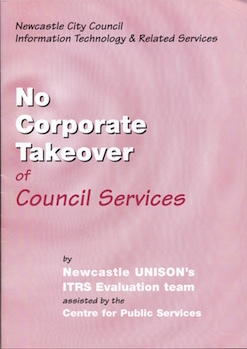 Newcastle City Council Part 1 makes the case for in-house capacity for change management, explaining how services could be reconfigured, how this could be financed and how corporate objectives could be achieved. Part 2 explains BT’s performance – its strategic blunders, outsourcing, cuts and closures (June 2002). Part 1 makes the case for in-house capacity for change management, explaining how services could be reconfigured, how this could be financed and how corporate objectives could be achieved. Part 2 explains BT’s performance – its strategic blunders, outsourcing, cuts and closures. Published on 28th November 2003. Last updated 26th May 2017.